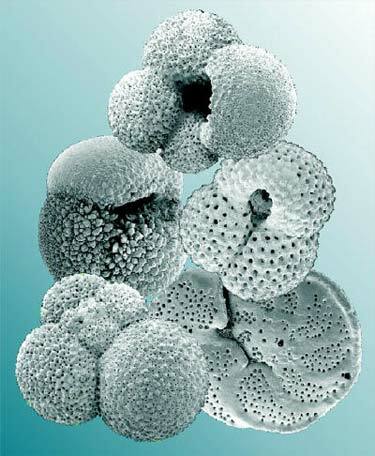 Foraminifera are single-celled organisms encased in shells of calcium carbonate. Most dwell on the sea floor, but about 40 species are found as plankton in the world’s oceans. As foraminifera grow, they add chambers to their shells. They are a well-researched group of creatures; their excellent fossil record allows scientists to reconstruct past environments and climates. This electron microscope photograph shows three plankton species and one sea-floor dweller (lower right). Their actual diameter is about one-third to half a millimetre. Clockwise from top: Globigerina bulloides, Globigerinoides ruber, Cibicides wuellerstorfi, Globigerina bulloides, Globorotalia inflata.